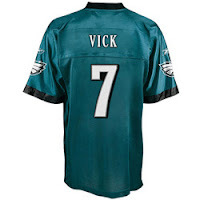 Bleed Eagles Green: Philadelphia Eagles Blog: The Vick Questions?? So I am at the game last night and the guy at the end of our row stands up and shouts "WTF, Eagles get Vick!" WTF sums it up pretty nicely for this fan too. The Eagles have enough money to pay Vick but couldn't shell out the extra money to resign a strong character guy like Brian Dawkins. Dawkins symbolizes EVERYTHING that is good and right about a football player. Sure Dawkins might have been on the downside of his career, but aren't Vick's best days behind him as well? I recall Michael Vick walking off the field in Atlanta and giving the home fans the middle finger in response to being booed. Good luck in Philadelphia Michael. The Eagles are just setting themselves up for trouble outside the stadium. Protesters and drunk Eagles fans won't mix well. The Eagles have a tendency to struggle when the pressure / spotlight is on them. Guess what...the spotlight will now ALWAYS be on the Eagles. Does Philadelphia really want to be the fan base that will be forced to cheer Michael Vick when he scores a TD? Those cheers will make us fans seem awful shallow. With the current make-up of the offense can Vick really help? The Eagles already have a top-5 QB, a top-5 RB, a stud rookie RB, and too many quality (and fast) WRs to choose from. Unless Vick can play RT his value (even in plays of trickery) is minimal for the Eagles. These are just a few of my initial thoughts. I am sure we all have our own opinion on the Vick signing. Overall, I just think that the negatives far outweigh the positives in this signing. Of course everyone, including Vick, deserves a 2nd chance in life, but I just think Philadelphia is the wrong place for Mr. Vick's 2nd chance. I like your arguments....and yes people deserve second chances, but maybe not to the tune of millions and back in the public eye. I think Charles Manson should be given a second chance and the Eagles could sign him as a defensive coach. Now that would scare a lot of offenses.